When Josina de Bondt died - during World War II - on November 17, 1943, in Zwijndrecht, Holland, she was 93 years and 4 months old. Josina was born in Zwijndrecht on July 5, 1850, as the 3rd of 8 children of blond, blue-eyed Anthonie (“Thomas”) de Bondt (1822-1891) and his wife Pietertje den Hollander (1823-1915). On May 15, 1852, Josina's next sibling was born and named Joost - like his paternal grandfather. 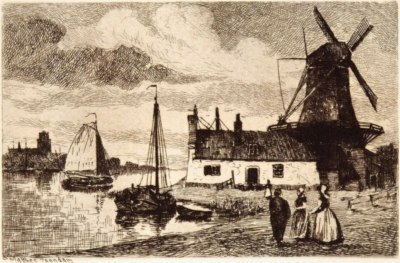 On October 3, 1872, in Zwijndrecht, Josina was married to Cornelis van Wingerden. Both her parents were present at the ceremony and gave their permission for the marriage. The bride and groom were so poor that they were unable to pay the municipal wedding expenses. Cornelis was born on August 11, 1841, in Zwijndrecht as the eldest son of Klaas van Wingerden (1813-1855) and Jaapje van Wensveen. Cornelis had been exempted from military service. He worked as a workman and gardener. On February 21, 1873, in Zwijndrecht - 4½ months after her wedding - Josina gave birth to her eldest child, but the boy lived for just 1 month. Josina's next child, a son named Jacob, was born in Zwijndrecht on August 20, 1876. The next moth, on September 7 in Zwijndrecht Josina's brother Joost de Bondt was married to Cornelis' sister Anna van Wingerden (1855-1926). Cornelis was one of the witnesses at this wedding. Cornelis van Wingerden and Josina de Bondt were to have 7 more children during the period 1878-1892. Cornelis was assisting his brother-in-law Joost de Bondt on May 21, 1892, in Zwijndrecht, when Joost reported the birth of triplets Cornelis, Arie and Corstiaan on the 20th. Sadly, within 3 days all 3 new-born children had died. Besides the triplets and a stillbirth, Joost de Bondt and Anna van Wingerden had 6 additional children. The children Anthonie, Jaapje, Pietertje, Wiekert Gijsbert and Nicolaas Cornelis would reach the age of majority and marry. Jacob, the oldest surviving child of Cornelis van Wingerden and Josina de Bondt, was the first to marry in 1904. By 1919 their other children Anthonia, Klaas, Adriana Cornelia, Cornelis, Josina and Maaike were all married, too. Cornelis van Wingerden died in Zwijndrecht on April 23, 1911. His widow, Josina de Bondt, survived him for 23½ years. Josina may have inherited her strong genes from her mother, Pietertje den Hollander, who had died in Zwijndrecht on February 6, 1915, aged 91 years and 8 months. A mill in Zwijndrecht with a view at the city of Dordrecht. One of the common ancestors of Josina and me is whaler Thomas Brullee. Another common ancestor is Joost Cornelisse de Bondt (±1680-1753).